At first glance you could be mistaken for thinking that there's not much call for diary products in many recipes. However although you might just pour milk on your cereal and eat cheese in a sandwich, there are actually many more culinary uses for all those lovely products that we have cows to thank for. 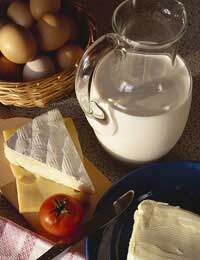 This is our staple dairy product and it has many uses in the kitchen. Milk makes a really good poaching liquid and it works particularly well with fish. You can add herbs or spices to it, as it simmers, and this will impart further flavour to the fish. Milk is also used in many bread, cake and biscuit recipes but always follow the recipe instructions carefully as milk can burn and stick to the pan if it gets too hot. If you fancy trying out your own white or cheese sauce, you'll need milk aplenty. They're easy to make and will taste far superior to anything that comes out of a packet. For a really simple cheese sauce, whisk 2 tablespoons of plain flour with enough milk to make a thick paste (taken from 300 ml). When the paste is nice and smooth, transfer it to a pan over a low heat. Gradually stir in the rest of the milk and bring the sauce to a light simmer. Sprinkle in a good handful of grated cheddar and stir well to avoid lumps. Keep stirring over the heat until the sauce thickens. Grill slices of halloumi until lightly golden. Cut into strips and serve with French beans and new potatoes for a hearty salad. Grill a couple of pieces of bread on one side. Turn over and top with slices of cheddar cheese and some sun-dried tomatoes. Grill until the cheese melts. Lightly grill some mozzarella slices and pile up with alternate thick slices of beef tomatoes and basil leaves for a quick starter. Fry a very finely sliced leek in some olive oil. Add a couple of sliced sun-dried tomatoes and about one-third of a block of feta cheese. Cook until melted and serve with pasta. Without butter we'd be at a loss for cakes and biscuits. Butter also adds a lovely glaze to risottos and to any number of sauces. In fact, despite being on the 'naughty' list of foods, it's one of those indulgences that can't simply be substituted in certain recipes. You can make a lovely sauce with little more than a chopped shallot fried off in a knob of butter and finished with a glug of white wine. Always keep a pat of good quality butter in your fridge. Single, double, whipped, soured - it can be exhausting just trying to work out which kind of cream to buy. However, it does come in handy in the kitchen and if you do a lot of cooking you'll find that you use it every now and again. Certain sauces really benefit from the addition of cream, as it has that extra richness about it. You often won't need much to really notice the difference in taste. A swirl of single cream will also add the finishing touch to many a bowl of soup, particularly tomato-based flavours - and mashed potatoes will never taste the same again, once you've tipped in a touch of cream before mashing. So, that's just a few ideas for some of our more popular dairy products. A splash of cream or a knob of butter really can help to transform a dish and it's good to keep your fridge stocked up with these essential ingredients.